The fourth entry in the Basic Guide series, Basic Guide to Industrial Hygiene is an essential reference for anyone needing an elemental understanding of the growing industrial hygiene field. 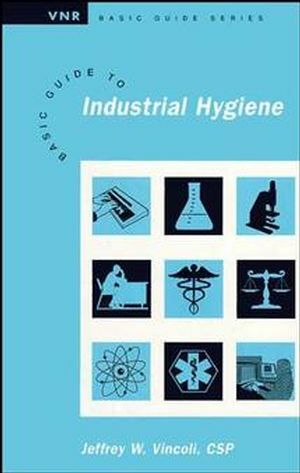 Written in a highly readable, easy-to-understand style, Basic Guide to Industrial Hygiene explains what industrial hygiene is, how it developed to its present professional level, and how to establish an industrial hygiene program. It also contains related information on such subjects of interest as human anatomy and industrial hazards. If you are a safety professional with limited experience in industrial hygiene, or if you are just beginning a career in industrial hygiene, this book will provide you with a thorough introduction to the fundamentals of this important discipline. This is what the reviewers are saying about Basic Guide to Industrial Hygiene: ".will help someone to understand what industrial hygiene is, what it is about, the nature of the problems that industrial hygiene addresses and the general nature of controls." Roger Brauer, PhD, CSP, PE Technical Director, Board of Certified Safety Professionals "Mr. Vincoli is an excellent writer. His writing style holds your interest." Wesley R. VanPelt, PhD, CHP, CIH President, Wesley VanPett Associates "There is nothing like it in the field. It is needed by both higher education and practicing safety professionals who are being thrown into industrial hygiene things for which they have little preparation. This book lays it out for them. "Keith E. Barenklau, PhD, PE, CSP Associate Professor and Program Director, Marshall University About the VNR Basic Guide Series The Van Nostrand Reinhold Basic Guide Series focuses on topics of interest to today's safety, health, and environmental professionals. These manuals promote a quick and easy familiarity with certain subject areas that may be outside the professional's main field but are required knowledge on the job. About the Author Jeffrey W. Vincoli is a Certified Safety Professional (CSP), Registered Environmental Professional (REP), Certified Safety Specialist (WSO-CSS), Certified Hazard Control Manager (CHCM), and Certified Accident Investigator. He has also published a number of articles and books on these subjects, including the first three books in the Basic Guide series (VNR 1993-1994). Regulatory Agencies and Their Requirements. Establishing an Industrial Hygiene Program. Toxic Chemicals and Corrosive Agents. The Hazards of Exposure to Energy. Occupational Exposure to Biological Hazards. Industrial Hygiene Sampling and Monitoring. SUPPLEMENTING THE INDUSTRIAL HYGIENE PROGRAM.